Prohibition flasks… thermometer sets… Waterman had tricks up their sleeves! Not just vintage pens, but sets for working. The 1941 set is a Doctor’s set. The #2 size Doctor’s lever-filling Fountain Pen – Thermometer Set in white. A very rare set, new-old-stock, and in mint condition! The fountain pen has a fine nib, but this is a great set for collectors of Watermans, and unique pen sets! 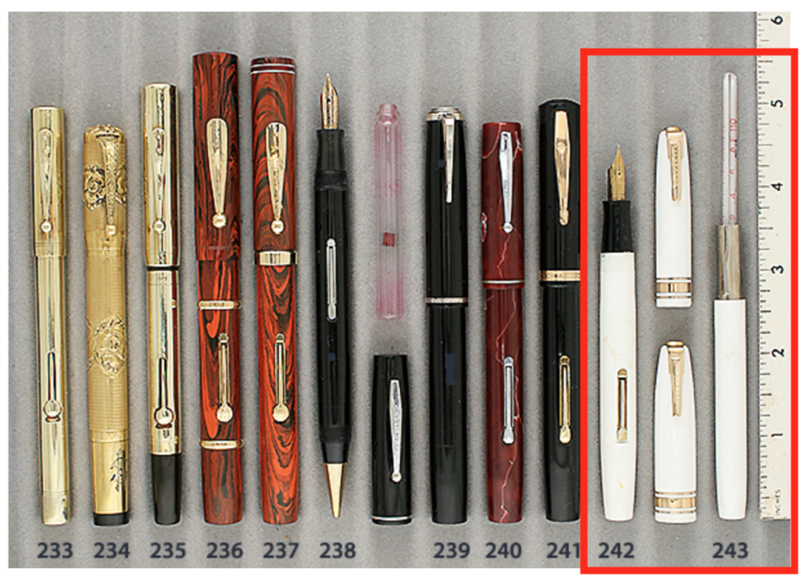 This entry was posted in Vintage Pens and tagged Catalog, Catalogs, Waterman. Bookmark the permalink. Follow any comments here with the RSS feed for this post. Post a comment or leave a trackback: Trackback URL.